I think one of the necessary evils in trying to run a photography business is putting your work on display. This past week at Austin Java on Barton Springs in Austin, Texas, I was able to display 21 framed prints. Thanks to the guy in charge of this display, it was made super easy for me (Quincy, I really appreciate how easy you make it!) It is always hard for me to choose which images to print and frame. It seems the photos I like are not always the crowd favorites. I think sometimes my enjoyment of a particular place interferes with the images I choose. After much deliberation, I came up with an assortment of Austin skyline images, Texas bluebonnet images, Sunflower images, Colorado images, and even a few images from the Cinque Terre in Italy. I’ve also launched a website dedicated strictly to Colorado photography. I have a long way to go on the site, especially formatting and uploading all the images, but it is a start. I’m doing this after spending the last few years attempting to hone my skills in SEO tactics. I hope to post a blog about my findings one of these days, as well as the results I’ve had with several different photography website hosts. But that is a post for another time. So for now, here is one of the images I have on display at Austin Java from now until the end of October. It comes from the Texas Hill Country from the spring of 2012. 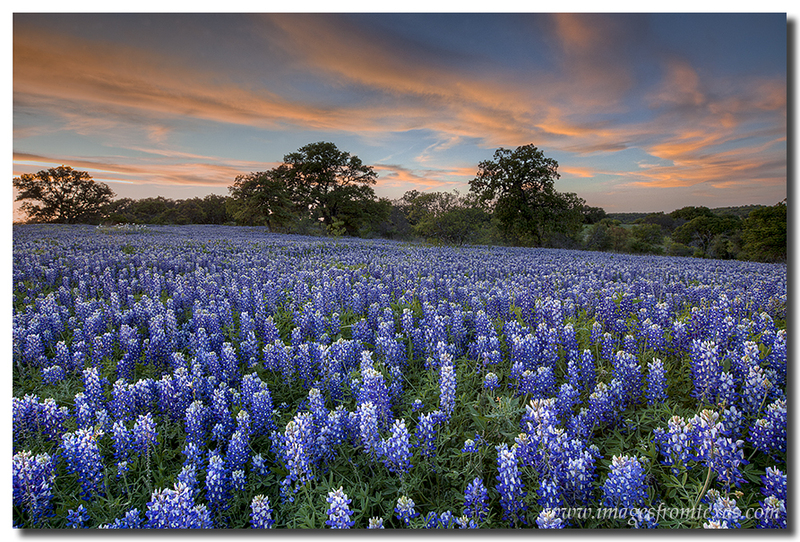 One of my favorite bluebonnet images from the spring of 2012 – taken in the Texas Hill Country on a perfect evening. The Austin Skyline with bats, bats, and more bats! In my previous post, I had offered up a picture of the Austin skyline taken from the Milago’s roof. I visited this location several times this August in an attempt to photograph the bats of Congress Bridge as they departed on their way to find their evening meal. I needed a clear, calm sunset so the bats would show up against the orange sky. (If it was cloudy, they would not show up as well). I finally had this opportunity this past Friday evening. The sky was clear, the colors were great, and the bats started their nightly departure just after sunset. It was curious, though, because I was photographing from the Austin Hyatt the week prior and the bats left about 7:30pm – 40 minutes before sunset. Not sure what was going on with their internal clock! Nevertheless, the bats soared into the Texas Hill Country sky and made a plume of bodies heading south. 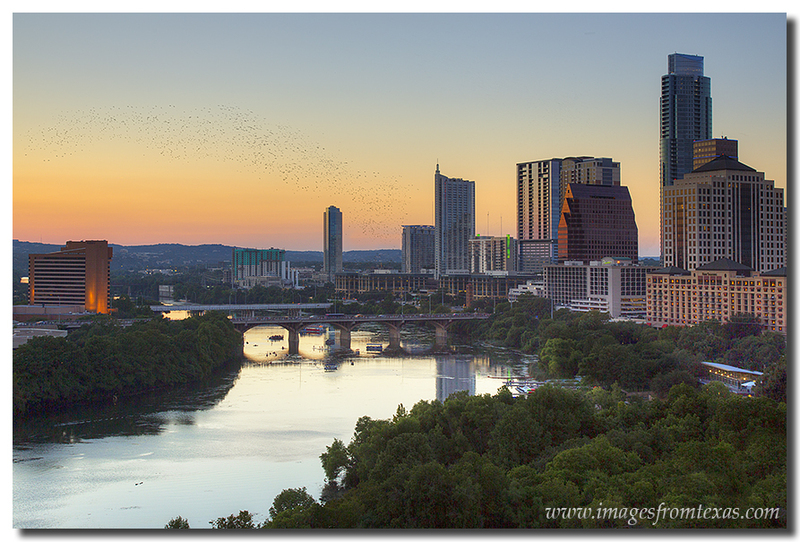 This Austin Skyline image shows some of the more well know buildings in Austin such as the Austonian, the 360 Condos, the Springs Condos, and the Austin Hyatt. Ladybird Lake was hosting more than several sightseeing boats, and folks were gathered all along Congress Bridge to watch the nightly spectacle. Bats soar into the evening sky for their nightly search for food in this Austin Skyline Image. The Austin skyline is one of my favorite scenes to shoot, and images from the roof of the Milago are some of my most enjoyable. I’ve developed a good working relationship with the folks there and have enjoyed many memorable evenings from that vantage point. This past New Year’s Eve I was able to capture several nice Austin skyline images with the fireworks over Ladybird Lake (also known as Town Lake). This month of August, I’d been down there several times to photograph the bats – with only one time successful (that is for another post). This particular evening, the bat show was less than spectacular, but the sunset was amazing. The clouds were then, and when the sun dropped below the horizon the sky lit up with oranges, reds, purples and blues. Really beautiful. Also in this Austin cityscape picture, you can see some of the more iconic buildings (the Frost Bank Tower notwithstanding). The tallest building on the far right is the Austonian, the tallest building in Austin. I’ve had the good fortune to shoot from their penthouse suite, as well, and that is quite the view. Further west is the 360 Condos and the Springs Condos. Both have great views ,too. Across the river is the Hyatt Austin. It offers a wonderful view of downtown Austin from its highest balconies, but right now there is construction to a new building that leaves a gaping hole in an otherwise nice photo. (I was over there last week to shoot, but didn’t stay. We talked and I’ll be back there in about 6 months when things are looking a bit cleaner). The Austin skyline is constantly growing, it seems. I took the liberty of photoshopping out a few distracting cranes from this image. Everything else was just beautiful. This is one of my favorite views of downtown Austin and Ladybird Lake (Town Lake). 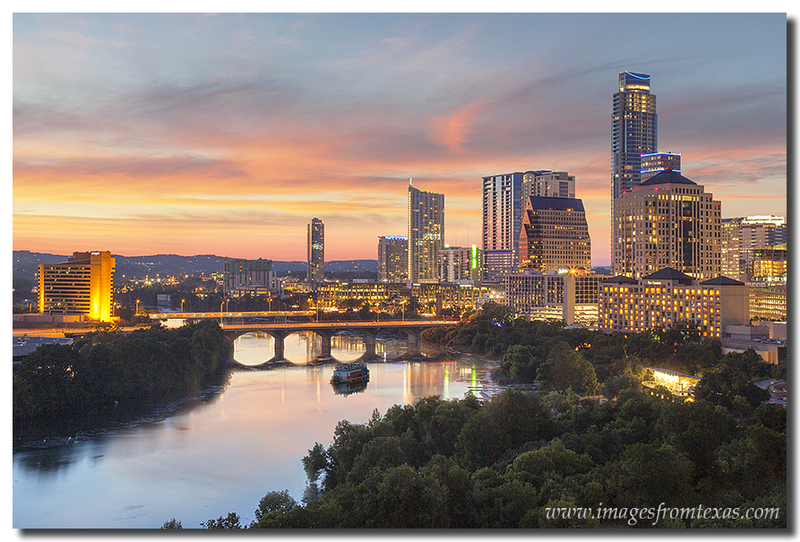 This Austin skyline image was taken on a mild summer evening, and the panorama view from here allows you to take in the Austin cityscape in all directions. Some of Austin’s highrises are prominently displayed, as well, including the Austonian, the 360 Condos, the Springs Condos, and the Austin Hyatt. Floating along the river is the Lone Star Riverboat, a small cruise ship that takes tourists and locals on a boat ride along Ladybird Lake. As I do every summer for the last 20 years, I was fortunate to spend the summer of 2013 in Colorado. With a home base in Winter Park, Colorado, for the last 6 weeks, I’ve been camping, driving, hiking, and shooting all over the Rocky Mountains and building my Colorado Images website. I’ve been blessed to spend time in the San Juan Mountains, as well as the northern Rockies near Rocky Mountain National Park. I imagine I’ve hiked over 160 miles and climbed nearly 40,000 vertical feet over the last 40 days. I’ve seen valleys of amazing wildflowers, mountain goats at over 14,000 feet, storms that left the forest floor white with hail, and sunrises that would take your breath away. One of my favorite places in Colorado to shoot is the Maroon Bells near Aspen. These two 14,000′ mountains, North and South Maroon Peak, are two of the most regal and photographed summits in the Rocky Mountain state. My family was with me most of this time, including my wife and two little girls, which makes the time up there even more special. They are patient with me and my photography perfectionism, as well. But since this is my business, they seem to understand. I’ve also been in the process of switching web providers this summer. As my business has grown, I’ve found I need to move to a faster server and a more user-friendly website, so hopefully this will work. I’ll evaluate this in about 10 months and see how things are progressing. If you, the reader, have any suggestions or comments, please feel free to share. My family and I returned to our home in the Texas Hill Country this weekend and are reacquainting ourselves with the Texas heat. This will be an adjustment because I don’t recall a temperature over 81 degrees for the last 6 weeks. Yes, it was nice. Upon my return, I already have several shoots in Austin lined up. I’ll be shooting the Austin skyline from the top of two of Austin’s buildings in the next few weeks. I’m also looking forward to the Perseid meteor shower that lasts for several days later this month. So here is an image from Colorado – my last hike of the summer. 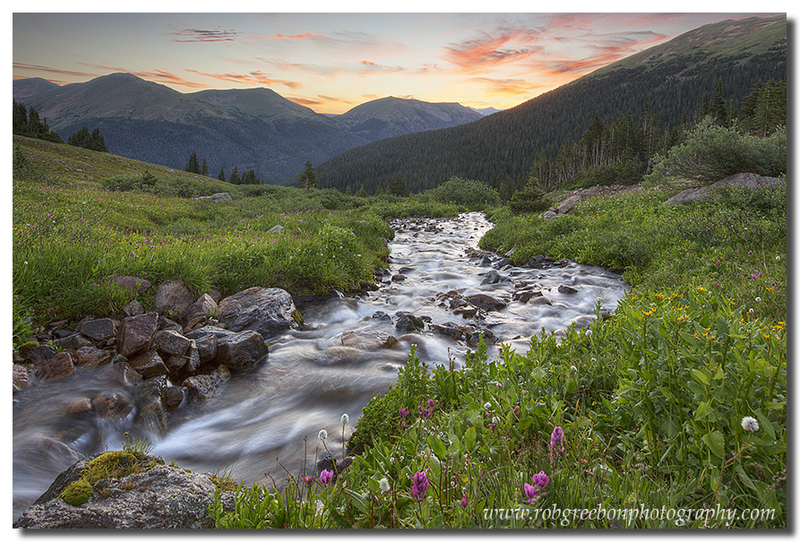 I awoke around 3am to hike up to one of my favorite locations – Butler Gulch. The hike itself isn’t far, but it does have some uphill for the last mile as you near the 12,000 foot mark in elevation. The wildflowers up there are amazing and the snow-fed streams are serene. Despite temperatures in the high 30s on the hike up, I was covered in sweat by the time I reached my destination. I wanted to arrive to shoot the Milky Way (which was awesome), but standing around waiting for the sunrise after that left me shivering and eagerly awaiting the first sun rays of morning. Sunrise over the Rocky Mountains always make for a beautiful Colorado Image and memory. I hope you enjoy what you see as I share my travels, my vision, and my passion with you.